John Plunkett was in another conversation about six feet away and had overheard our discussion. He stepped up and said “and I will help him.” Those that know both of us know that I would need a lot of help and that he would be a good source. 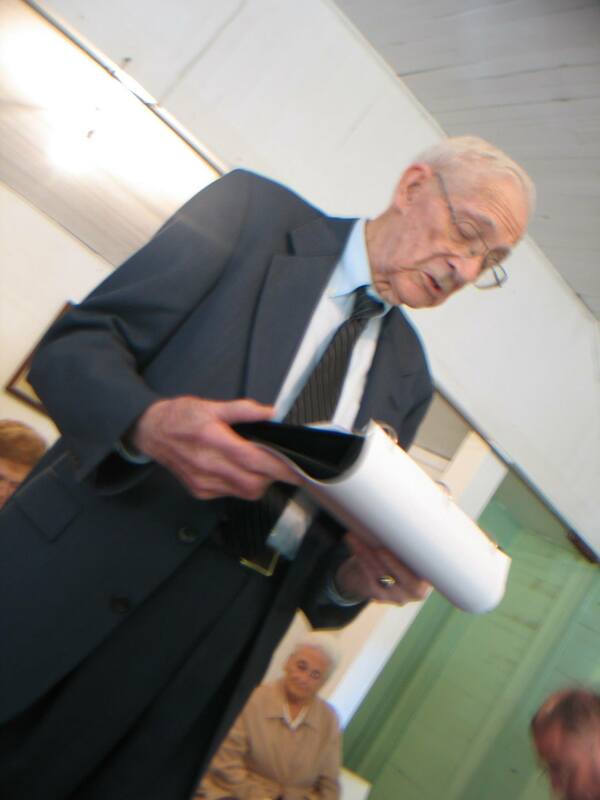 Raymond C. Hamrick leads one of his songs after the 2008 singing at Andrews Chapel. Photograph by Aldo Ceresa. Raymond was reluctant. He kept saying that the songs may not be any good, and he did not want to distribute a bad song. I assured him that I would just typeset them, and that John and I would not even show them to anyone until he approved. Much later I was told that Raymond once told Harry Eskew that I harassed him unmercifully until he gave me a few songs. I don’t deny that I was aggressive, and he gave me four songs, which I typeset, made a few copies, and took them to the 2006 singing at Andrews Chapel. We asked if we could distribute the copies and get the class to sing them. He said of course not! We would not interfere with a singing for that exercise. Then we asked if we could invite singers to come back inside after the singing to sing them. He agreed to that. Two things surprised him. He was astonished at the excitement of the singers, and he was surprised at how good the songs sounded. Finally, he was willing to think about typesetting his music, but he was still not confident the music merited publication. When we sang the songs, people would ask me if they could keep the copies. My answer was that they belonged to Raymond, and I could not give them away. Raymond did not want the copies to get out. In fact, a singer from afar visited Raymond and told him how much their group had enjoyed singing a particular one of these songs. It bothered him. He asked me how they got the song to sing. I became more careful. For a couple years, Raymond would send me a song from time to time, and I would try to typeset it. The program I was using (Mup from Arkkra) is very good and easy to use, but I didn’t know what I was doing and I made a lot of mistakes, but I was learning, and the number of songs was increasing. John Plunkett was doing the proofing, and he can verify that there were a lot of corrections. Throughout this process we were discussing the music with Raymond and John was helping Raymond in several ways, not the least of which was to find words for the music. One of my favorite stories, which I am sure Plunkett is tired of hearing me tell, involves song 54. The words were from hymn 337 of a book he had borrowed from John, and the notation he wrote at the top of the page was “John 337.” Knowing that chapter 3 of John had only thirty-six verses and needing a title, he added the colon as a joke, so the “John” in the title “John 3:37” is John Plunkett. Raymond C. Hamrick’s “John 3:37,” from The Georgian Harmony. These discussions took us to Macon fairly often to visit with Raymond and discuss the book. Those visits richly blessed the Hollingsworth family. When we traveled to see him on Sunday afternoons, Angela would go with us, and we would have great visits. Angela and Elsie were visiting (Angela sometimes took notes), Raymond would tell stories from the past, Billy was studying and asking questions about the music, and sometimes I was working on corrections. Wonderful memories! On one occasion, we were discussing the harmony of a song and Angela volunteered that the alto line had a note she did not like to sing. He responded “Which note is that, sugar?” Then he asked “Well, what note would you like to sing?” When she told him, he thought for a bit and then said “Well, that would work,” and turned to me and told me to make the change. Then he said he certainly did not want to look up and see the altos frowning. Raymond C. Hamrick with Anna and Erica Hinton at Emmaus Primitive Baptist Church, Carrollton, Georgia. Photograph by Aldo Ceresa. In a different visit, he said it was very important to give each part a song the singers enjoyed singing, and that sometimes it was necessary to accept a little dissonance toward that end. Eventually we put together a paperback book and sang from it in several places, including the home of Mary Brownlee, Emmaus Primitive Baptist Church in Thomaston, Vineville Baptist Church in Macon, and a few other locations. Eli Hinton was a baby at the Vineville singing and Raymond titled one of his songs “Elijah” in honor of Matt, Erica, Anna, and Eli Hinton. Once at a Sacred Harp singing, Raymond asked Elsie “Well when are we going to have another all-day singing from the Georgian Harmony?” She responded “When can you make it?” and he said “Well, I don’t work New Year’s Day,” and so began our January 1 singing at our house. At some point, it was clear that Raymond was ready for the book to appear, so I got busy trying to get things in a presentable format. I had had no idea how far my effort at that point was from a publishable standard, but we began to try. 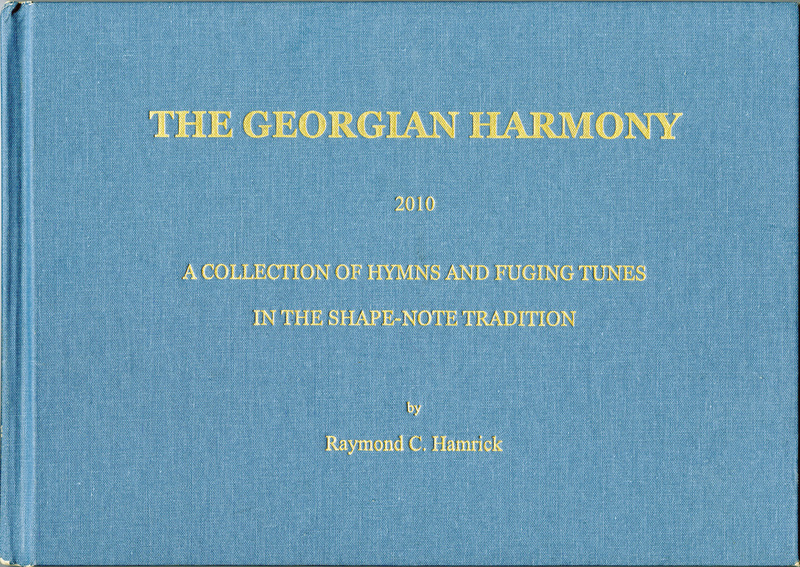 Cover of the spiral bound Georgian Harmony. 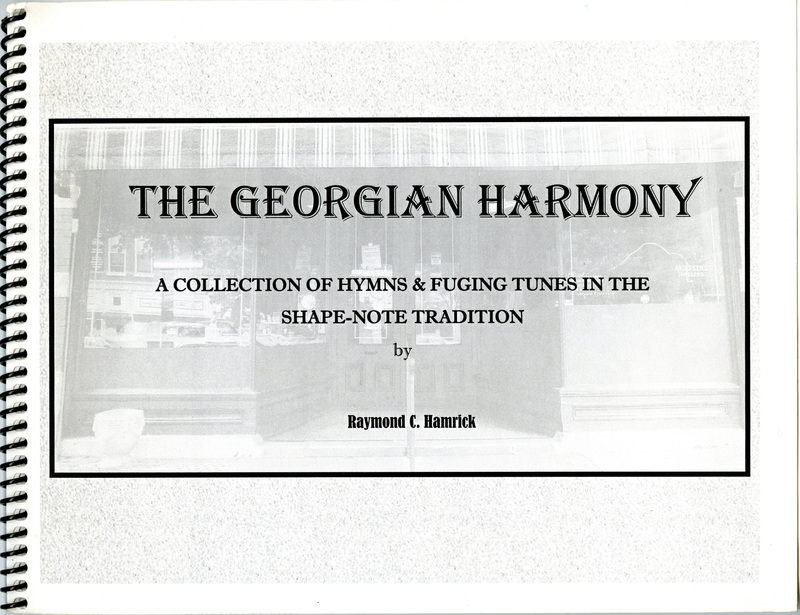 Cover of the second edition of The Georgian Harmony. 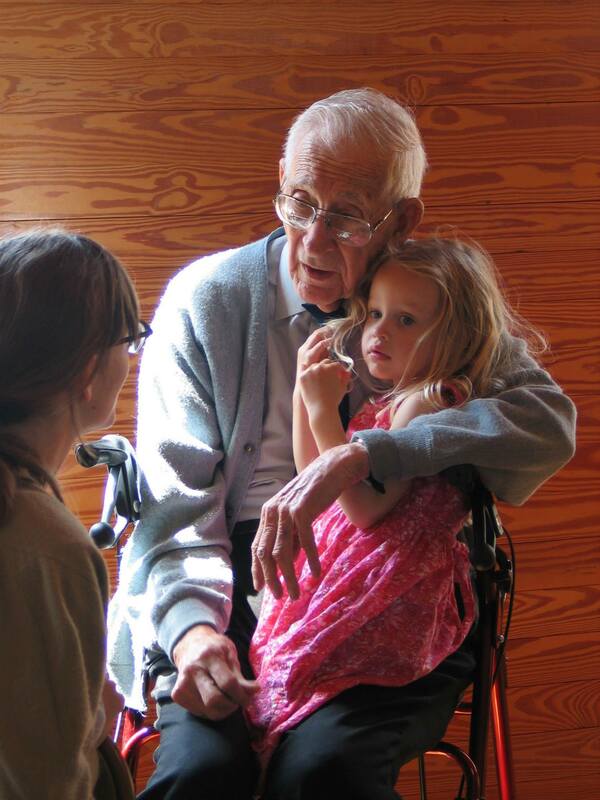 On the last visit before submitting the document to the publisher, I was working and Elsie was visiting with Raymond. She later told me that he told her that day that he had found some more songs, but said “I’m not giving them to John Hollingsworth; this book would never get published.” On a later visit after the book appeared, I told Raymond that Elsie had told me that, and that I would like to typeset the additional songs. He had reasons not to do that. There was no point, because the book was already done. These songs had not been properly edited, and may not be any good. By this time Raymond had noticeably less energy than he had had five years earlier when the project had started, and he was still concerned about songs getting out that were not up to his standards. I assured him that I would just typeset, and not show them to others without his consent. Finally, Elsie said “Well, John is finished with The Georgian Harmony and The Christian Harmony, so he has the time to do it.” Raymond laughed heartily, and said “I know what you’re doing; you are just trying to get him out of your hair,” and he handed me a packet of songs. Wow! The songs he had given me previously were complete and all the chords had been checked very carefully. This batch was different. Many of the songs were incomplete, many were without lyrics, and some were just fragments. He later explained that when a little run came to him, he would jot it down. Later, if he thought it had merit, he might extend it into a melody, later another part, and eventually it might have all four parts, and then he would try to find words. This batch had examples of each of those stages of development. As promised, I just typed whatever he gave me. One song I thought especially good, and on a trip to visit, I took my computer so I could play him the midi version of the song. Of course, the midi version is not a good rendition, and not much was said about the song, but he gave me a new composition. Elsie suggested, since I had the computer with me, that I type some of the music so Raymond could see how I did it, so I did. I told him of each keystroke and what it meant, and I typed a few measures, and hit “display” so that he could see the results. He seemed confused, and asked me about half a dozen questions (“how did you get the measure bars to align,” “how did you draw the beam lines,” etc.). The answer to each was “the computer does that automatically,” and he said “it seems to me you are telling me there is not much to this.” When I said “exactly,” he handed me another batch. Raymond C. Hamrick with Hugh McGraw and Bill Hollingsworth at Hamrick’s ninety-ninth birthday singing in Roberta, Georgia. Photograph by Aldo Ceresa. Several of the songs had all parts except alto, and at Billy’s request I asked Raymond if he would approve if Billy tried to write an alto and get Raymond to criticize, so that Billy could learn a little about composing. Raymond agreed, and Billy began studying Raymond’s altos. Eventually he wrote the alto to one of the songs, and I took it to Raymond. He studied it for a while, then said “this is good, let’s use it, but be sure to give him credit.” Billy continued studying Raymond’s music, asked a lot of questions, and ended up writing the alto for several of the songs. Now I had more “new” songs than were in the first edition of the book, and on average I thought they were even better than the ones in the book. There were so many that I made spiral bound, paperback work books of these songs. I made three copies, one for me, one for Raymond, and one for Billy, who was providing much of the help that John Plunkett had provided for the first edition. When we were visiting and discussing some of the songs, Raymond volunteered that he would really like to hear the class sing a couple of them. I pointed out that that would require letting people know a little bit of what we were doing, and I asked him if he wanted me to tell John Plunkett about the new songs, and if so, how many of the songs. He held out his copy of the workbook and said, “all of these.” Of course, that was a great relief; I had wanted to discuss this with John for months. 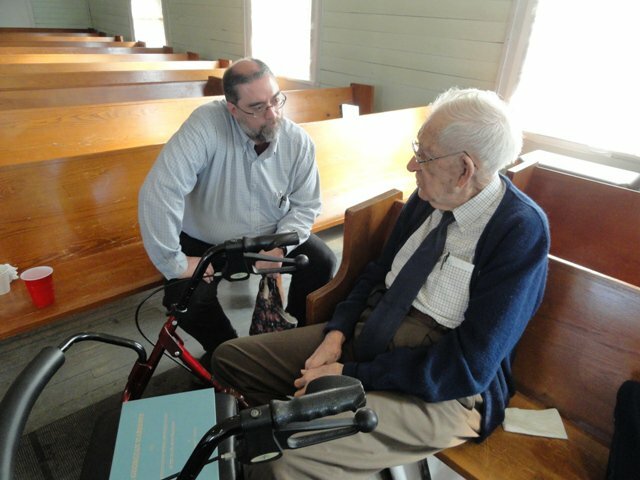 John Plunkett with Raymond C. Hamrick, at a singing from The Georgian Harmony at Liberty Hill Primitive Baptist Church, February 2011. Courtesy of Darrell Swarens. At this point it was clear to most that this music deserved publication, but the workbooks had not been scrutinized enough to meet Raymond’s standard, and such scrutiny would require a lot of examination. It was not clear Raymond had the energy to attack such an undertaking. One approach would be to get the singers to sing all the songs, make comments, and record them for Raymond’s listening. But this would take a lot of time. Singing through the parts and working on problems was necessary and time consuming. We were discussing this problem at our breakfast table with Eddie Mash, and I (in jest) suggested that we convene a good class at our house on Friday night, sing Friday night, spend the night, sing Saturday, Saturday night, spend the night, and continue until we finished. Eddie immediately endorsed the idea and promised to participate and try to get others to join in also. That is not quite how it was done, but it was reasonably close. We sang at several places, including our house (Friday night through Sunday morning), and finished at Shiloh Primitive Baptist Church. My heart was full; I was very touched at the effort so many singers made to help Raymond edit his music. He was very touched as well. The way it worked was this: I made enough copies of the workbook so each singer had a copy, on which they put their name. John Plunkett led us through the songs, usually singing the shapes for each part, then singing the song until we did it to his satisfaction. Billy made a recording for Raymond to hear, and, for each song, each singer made comments, rated the song, and suggested any needed changes. I then collected the workbooks and copied all the comments into one book, which I gave to Raymond. A lot of talent was assembled in these groups. Their criticisms were detailed and informed, and this was crucial to the process. Not only were the suggestions helpful, but, since the participants included such accomplished musicians (Jesse P. Karlsberg, Lauren Bock, Robert Kelley and others), this evaluation gave Raymond more confidence that we should publish this batch also. 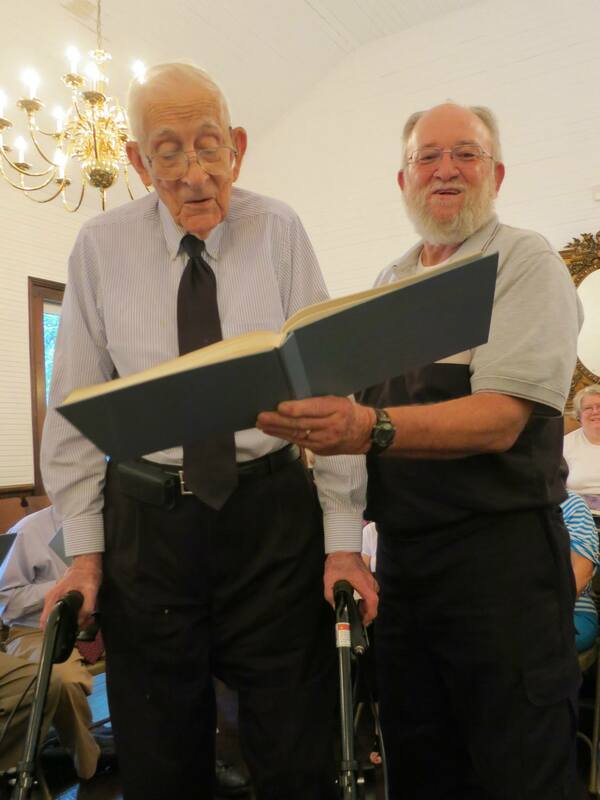 Raymond Hamrick with Oscar McGuire, leading from The Georgian Harmony at his ninety-ninth birthday singing in Roberta, Georgia. Photograph by Aldo Ceresa. I am reluctant to attempt to list the participants for fear that this old man will forget some, but those who helped included: Raymond Hamrick, Laura Akerman, Joan Aldridge, Angela Benton, Lauren Bock, Leslie Booher, Mary Brownlee, Helen Bryson, Judy Caudle, Mildred Chandler, Michelle Cull, Beverly Dayton, Meredith Dayton, Jeannette DePoy, Molly Ellis, Harry Eskew, Wesley Haley, Sharon Hamrick, Martha Harrell, Louise Holland, Bill Hollingsworth, Elsie Hollingsworth, John Hollingsworth, Sarah Kahre, Jesse P. Karlsberg, Robert Kelley, Andreas Manz, Eddie Mash, Hugh McGraw, Katy McGuire, Oscar McGuire, Judy Mincey, Andy Morse, Angela Myers, John Plunkett, Shannon Primm, Mary Ellen Shrock, Benjamin Smith, Margie Smith, Jane Spencer, Mike Spencer, Darrell Swarens, Stephanie Tingler, Charlene Wallace, Rosemund Watson, Chris Wilhelm, Kathy Williams, and Jonathan Wood. I apologize for omitted names. Of course, we did not publish it all. I have some songs I thought to be pretty good on which he wrote “DO NOT USE” across the top. I was embarrassed at all the errors in the combined book, but when I apologized to Raymond, his response was that the errors had not kept us from singing the songs. I’m still embarrassed, but he is right. Many people would have been happy to do the typesetting and would have done a better job, but I was retired and had the time, I was aggressive enough to get started, and I admired Raymond and his music. I am keenly aware that it was a great blessing for me and my family, and it turned out that the greatest blessing to us was not the music, but the time we spent with Raymond. 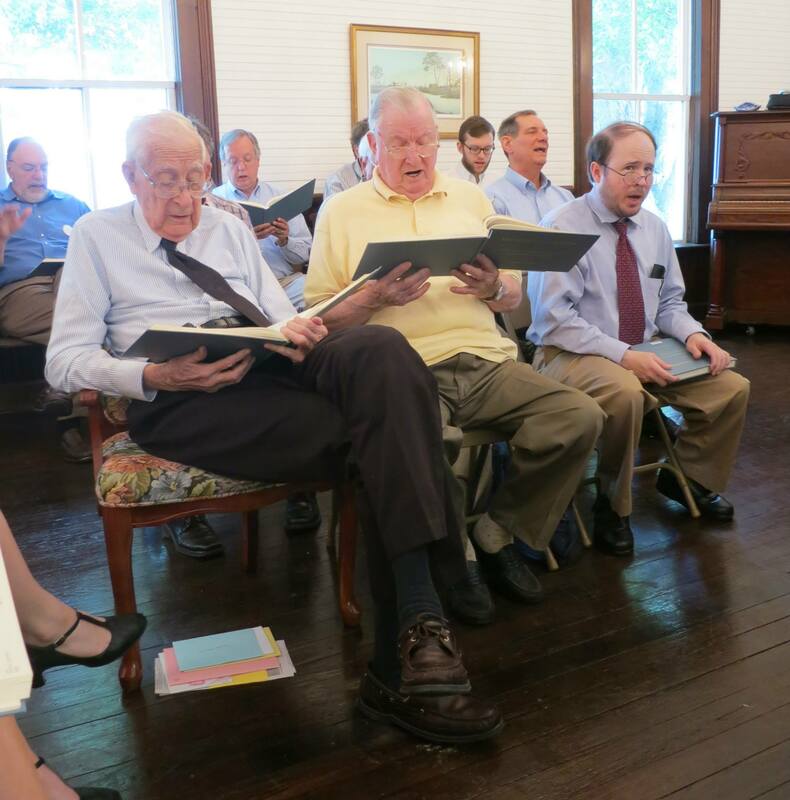 John Hollingsworth grew up in Mississippi singing from The Sacred Harp and The Christian Harmony. He is co-editor of The Georgian Harmony and chairman of the committee that revised The Christian Harmony in 2010.